A speed controller varies the motor speed by varying the voltage fed to the motor. So what happens to this voltage at the motor? Back EMF. 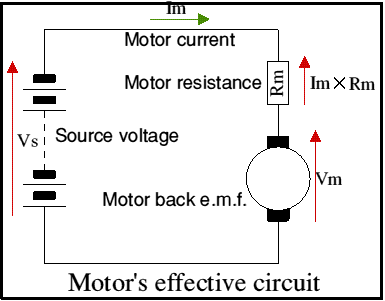 When voltage is applied to a motor, it rotates. This “applied voltage” is either the battery or the voltage fed to the motor by the speed controller. It is shown in the diagram, right, as Vs. As it rotates, the armature cuts the magnetic field and we all know that a conductor moving in a magnetic field generates a voltage. So the moving armature acts as a generator and generates a voltage (a ‘back emf’). As the motor speeds up, this back emf rises until it is nearly equal to the voltage the controller is feeding to the motor. The difference between the feed voltage and the back emf is the voltage that is actually doing the work of driving the motor, for it obeys Ohms law and it is this difference voltage that must alter as the motor loading alters. Vf = Vb + IRwhere I is the current the motor is drawing and R is the motor’s resistance.If the motor is lightly loaded the current is small, so the IR bit in the equation is small and the motors speed will be high so that Vb is very nearly equal to Vf. If the motor loading increases the current it draws must increase, so the IR bit gets bigger and (if we keep Vf constant) the motor must slow down a bit so Vb drops by the amount IR has increased. In most applications, the driver is operating the speed control so will automatically increase the speed to compensate for the greater load. 24 = Vb + 0.05 x 2the IR term is only 0.1 volts. Now if we load the motor so it is taking 30 amps, the IR term becomes (30 * 0.05) – or 1.5v. The motor speed will drop by 6.25%. not a huge amount. However if the motor’s full speed is limited to 1/4 full speed, the effect is somewhat more noticeable. 1/4 full speed will mean a maximum of 6v on the motor, using the figures above. But this full speed restriction will not alter the I or the R in our equation. So the IR drop will still be 1.5v. 1.5v is 25% of 6v which is significant. Motor armatures are wound with copper wire. As copper heats up, its resistance rises. The IR voltage we have discussed above is lost as heat. Heat is Current squared times resistance, so I2R. So a loaded motor gets hot. It is this heating that limits the continuous current the motor can handle. However there is a lot of copper, and a lot of iron, in a motor. It takes quite a long time for all this copper and iron to actually heat up – maybe 15 minutes, maybe an hour! So for short periods of perhaps a minute, the motor can absorb a huge amount of heat and it is usually quite safe to run the motor at as much as 3 or 4 times its continuous rating for a minute or so. Clearly this timing is dependant on the motor design, but very few motor manufactures quote a short-term rating. Some motor controllers have IR compensation. In this, the controller measures the motor current and as this increases, it automatically raises its output voltage to partially offset the IR drop in the motor. Properly set up, this can be very effective. Wrongly set however, it causes the motor speed to vary and be unstable. Therefore it is not incorporated in 4QD controllers because of the difficulty in setting it correctly. This correct setting is further complicated by the fact that as copper heats up, its resistance increases. The maximum correction is determined by the cold resistance but the worst drops (that require the most correction) will occur in a heavily loaded (therefore hot) motor. A much more effective solution to this problem is by means of a tacho-generator as a speed sensor which is discussed elsewhere and which can be applied to some 4QD controllers.